Aurangzeb sent a firman (royal order) to Raja Budh Prakash, alias Mahi Prakash (also known as Bihari Chand) of Sirmaur who ruled from 1659-78), through his eldest son, Prince Muazam. Prince Muazam later ruled over the disintegrating Mughal empire from 1707 to 12, with the title of Shah Alam Bahadur Shah. A view of the Pinjore fort. To oust the Mughals, men and women suffering from goitre were directed to stand along the walls of the Pinjore fort every day to be seen by its custodians. 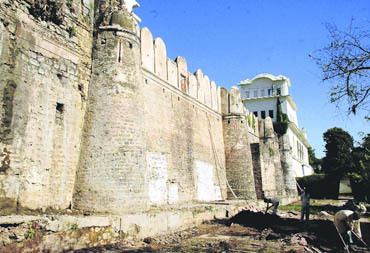 Fearing infection, the Mughals gradually abandoned the fort Photo. The firman is dated 17th year of accession, Hizri 1085, Cepher month’s first day (Firman No. 12, Tarikh Riyasat Sirmaur by Ranzor Singh). "... Chosen from the contemporary and equal ranking, Raja Budh Prakash... . Be it known during these days, it has come to the notice of our pious and benevolent chamber of request (arzgaah) that Akbar Nagar, which falls under Sohana, has been usurped by the worthless son of Zamindar of Sohana, Suraj Mal, who had earlier been expelled from the mentioned area. After annexing it to the Crown lands, it was granted to the faithful and worthy of Royal favours, Fidvi Khan (Aurangzeb’s foster brother), with all the powers and privileges which he enjoys in his own native estates. Without any reason and consideration of the consequences, Suraj Chand’s son, Pinjoria (from Pinjore) with some force, worth destroying, attacked and has captured forts of Muzafargarh and Jagatgarh. From our holy abode, which is of as great magnitude as the skies, Rustam Beg, Gurzburdaar (mace bearer) has been deputed, along with others and a large force to take you along with your force. You should at once advance to uproot this culprit from the earth. Therefore, our orders, which are obeyed by the world, must be followed. On receiving, proceed without delay and without any excuse. Kill this accursed person or drive him away from the concerned area, so that he dare not venture near again. You should then hand over these forts and the land to the men of Fidvi Khan." The Raja complied with the orders. Suraj Mal’s son was defeated and expelled. The forts were restored to Fidvi Khan, who started laying gardens and constructing pavilions in the Pinjore fort. Later, the Mughals themselves were ousted from Pinjore and the surrounding area, not by gun but by goitre — a fact well known to some villagers and a few historians. In a unique move, every day, women and men with swollen throats were sent along the fort walls and its gates, to be seen by the custodians and the ladies of the harem. The desired result came soon. Fearing to be possessed by the wretched disease, the fort was gradually abandoned. Soon wilderness took over the fort. Later, the Raja of Sirmaur took control of the fort. During the rule of Raja Vijay Prakash of Sirmaur (1717-48 A.D), Prince Kushal Singh, the younger brother of Raja Kehloor of Bilaspur (now in Himachal Pradesh), came to Nahan after a quarrel with his brother, the Raja. Here he was given a warm welcome. The Kehloor Prince was later assigned the entire area and the forts of Pinjore: Burj Kotian (near Pinjore), Jagatgarh (in Jagatgarh forests, Solan district, Himachal. Also known as Banasar Fort), Dhandardu (near Ramgarh) and Subathu, with his headquarters at Ramgarh, where Prince Kushal Singh Kehlooria’s descendents still live (Shere-e-Punjab ka Itihas, page 42 by Munshi Kali Rai, Tarikh Riyasat Sirmaur by Ranzor Singh). During the time of Raja Parteet Prakash of Sirmaur, 1749-57, Raja Garib Das of Mani Majra (now in Haryana) captured the forts of Pinjore, Dhandardu and Ramgarh. Prateet Prakash’s successor, Raja Kirat Prakash (1757-73), though young in age, was a gallant warrior. He recaptured Ramgarh and Dhandardu. On his way, he also captured Naraingarh from Laxmi Narayan and Laharpur fort, near Sadhaura (Haryana), expelling Idayat Khan Rasoolia (of Rasulpur) who was deputed by the Sikh chief of Kalsia. Kirat Prakash then took over Pinjore and marching further, took the fort of Baddi (now in Solan district in Himachal Pradesh). He defeated a Sikh contingent near Pinjore, where he named a village after himself, Kiratpur, which continues to exist on the Pinjore-Nalagarh road). Between this period 1796 and 1814, Pinjore fell in the hands of the Maharaja of Patiala. 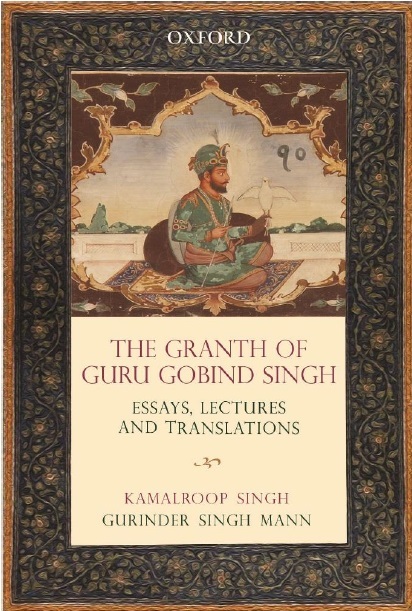 Naraingarh was captured by Maharaja Ranjit Singh at the cost of lives of his famous generals, Fateh Singh Kalianwala, Deva Singh Bhandari and 400 soldiers (History of Punjab by Mohammad Latif, History of Sikhs by Khushwant Singh). Laharpur went to the Raja of Kalsia (Chhachhrauli). Jagatgarh, Subathu and Morni forts were occupied by the Gorkhas. Kushal Singh’s sons Maldev and Narain Singh became the masters of Ramgarh and Dhandardu forts. The descendents of the Maharaja of Patiala further beautified the Pinjore fort, which is now with Haryana tourism. Part of the Ramgarh fort has been converted into a resort. The Naraingarh fort, which was given to Fateh Singh Ahluwalia by Ranjit Singh, now houses a police station. Jagatgarh, Baddi and Burj Kotian are in ruins. Morni and its fort were disjointed from Sirmaur and given to the descendents of Mir Bakar Ali of Garhi (near Raipur Rani), who had been deputed by Raja Jagat Prakash of Sirmaur, around 1779, (Sanad No. 88, 21st Sept. 1815 issued by Governor General of India). This fort is also crumbling. The Subathu fort is now under 14-Gorkha Training Centre. Only the debris remains of the Dhandardu fort. One tower of Laharpur fort still stands by the side of a pond, with creepers growing in its walls and scars of gunshots on its battlements. All this is reminiscent of Byron’s Lines as quoted by famous his historian Col James Tod (Annals and Antiquities of Rajasthan, Vol. I, Page 747).